Bees 'n blooms. Blooms 'n bees. 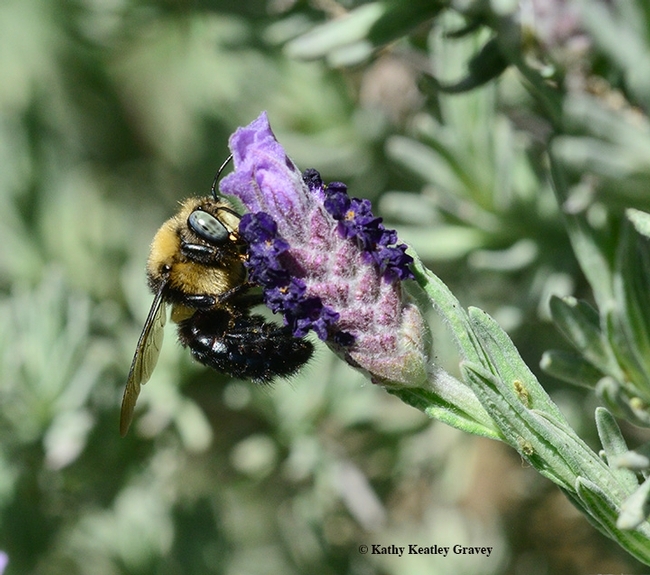 The book, the first of its kind, profiles some of the most common bee genera found in California gardens; their preferred plants, both native and non-native; and how to attract them. 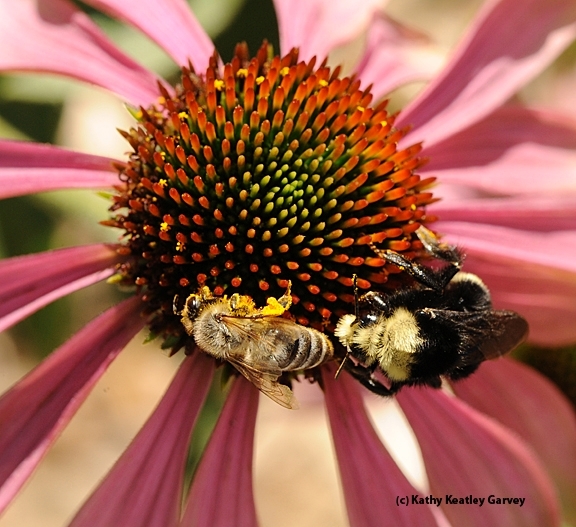 Most folks are familiar with honey bees and bumble bees. But what about the other bees, such as mining, leafcutting, sweat, carpenter, digger, masked, longhorned, mason and polyester bees? 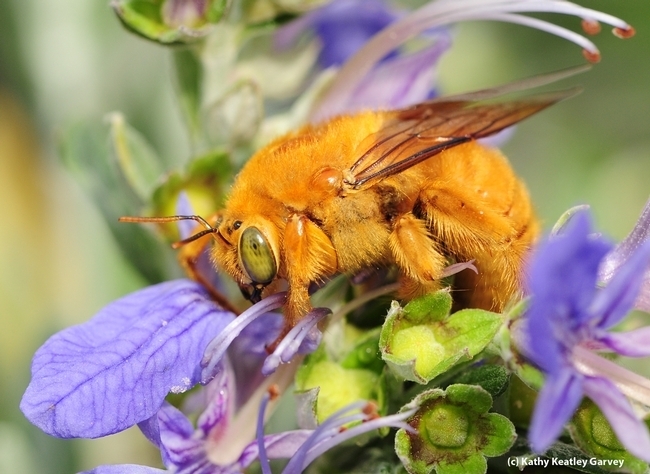 The authors point out that of the 20,000 bee species identified worldwide, some 4000 are found in the United States, and 1600 in California. Published by the nonprofit Heyday Books in collaboration with the California Native Plant Society, the book is the work of four scientists closely linked to UC Berkeley: urban entomologist Gordon Frankie, a professor and research entomologist at UC Berkeley; native pollinator specialist and emeritus professor Robbin Thorp of UC Davis (he received his doctorate in entomology from UC Berkeley); insect photographer and entomologist Rollin Coville, who holds a doctorate in entomology from UC Berkeley; and botanist/curator Barbara Ertter of UC Berkeley. 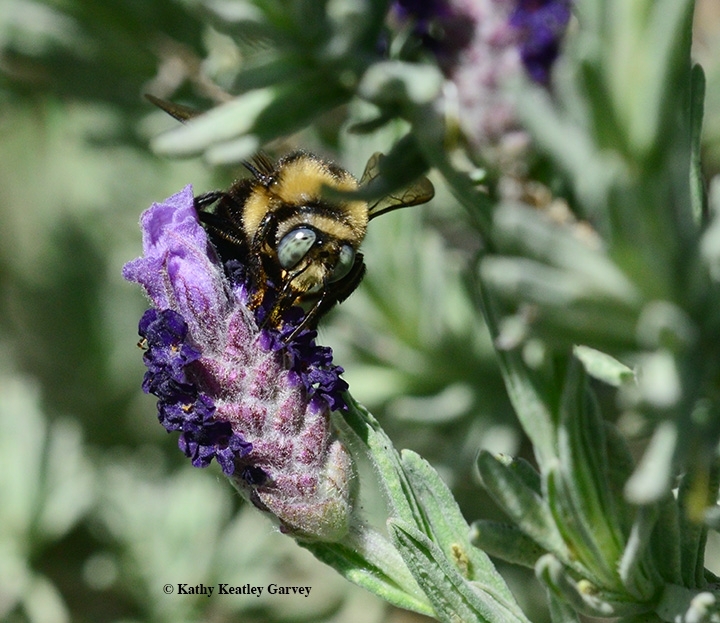 Frankie, who has researched bees in urban gardens in California for 13 years, says: “While the book is specific to California, larger insights can be gathered about the role of native bees in developed landscapes (such as agriculture), and native bee conservation." Frankie studies behavioral ecology of solitary bees in wildland, agricultural and urban environments of California and Costa Rica. 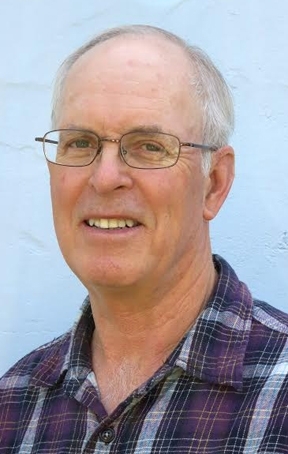 He teaches conservation and environmental issues. He is involved in how people relate to bees and their plants and how to raise human awareness about bee-plant relationships. 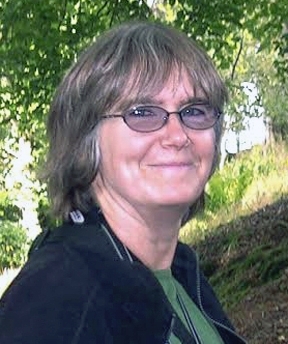 Co-author Robbin Thorp, who retired in 1994 after 30 years of teaching, research and mentoring graduate students, continues to conduct research on pollination biology and ecology, systematics, biodiversity and conservation of bees, especially bumble bees. 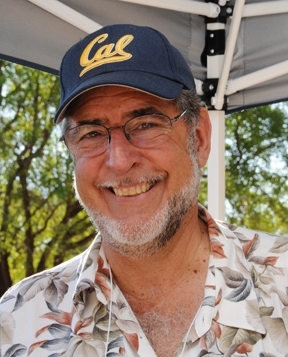 He is one of the instructors at the The Bee Course, affiliated with the American Museum of Natural History and held annually at the Southwestern Research Station, Portal, Ariz. 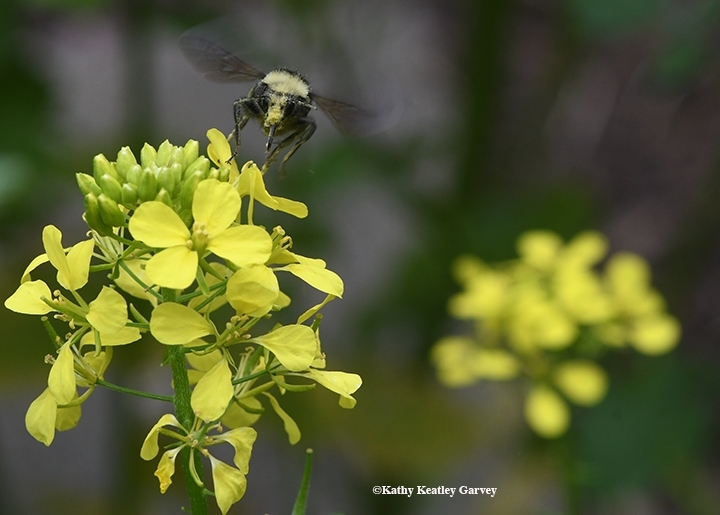 The course is geared for conservation biologists, pollination ecologists and other biologists who seek greater knowledge of the systematics and biology of bees. 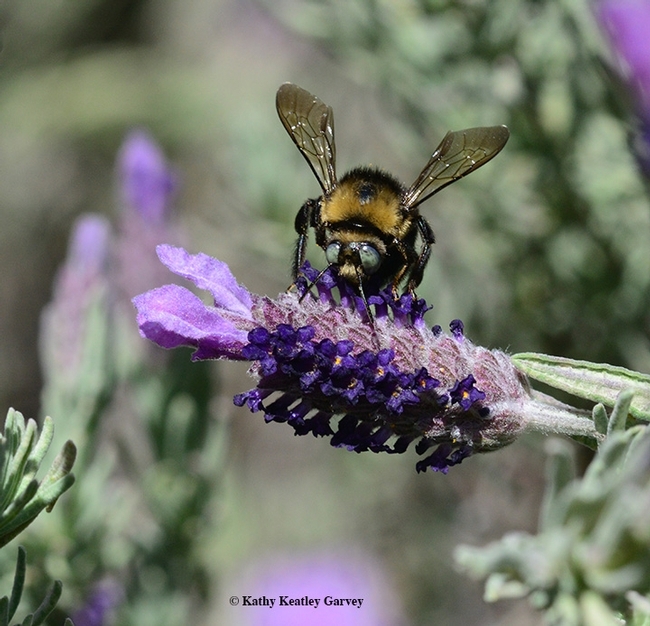 “The book is profusely illustrated with photos and drawings of bees and flowers, especially notable are the magnificent close-up images of bees by co-author Rollin Coville,” Thorp said. Ertter thoroughly explores the anatomy of a flower. Bees and flowers constitute what the authors delightfully describe as "a love affair." 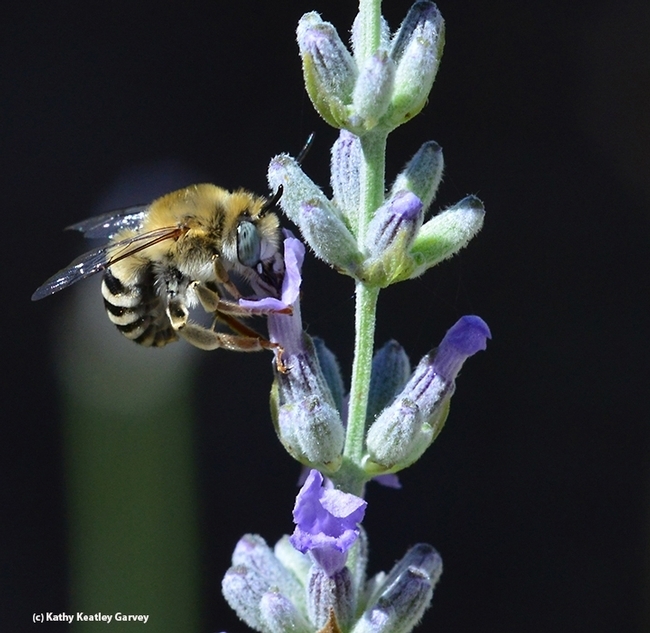 California Bees and Blooms lists 53 of urban California's best bee attractors identified through the Urban California Native Bee Survey. Among them: aster, bluebeard, catmint, California lilac or Ceanothus, cosmos, California sunflower, red buckwheat, California poppy, blanket flower, oregano, rosemary, lavender, gum plant, and salvia (sage). 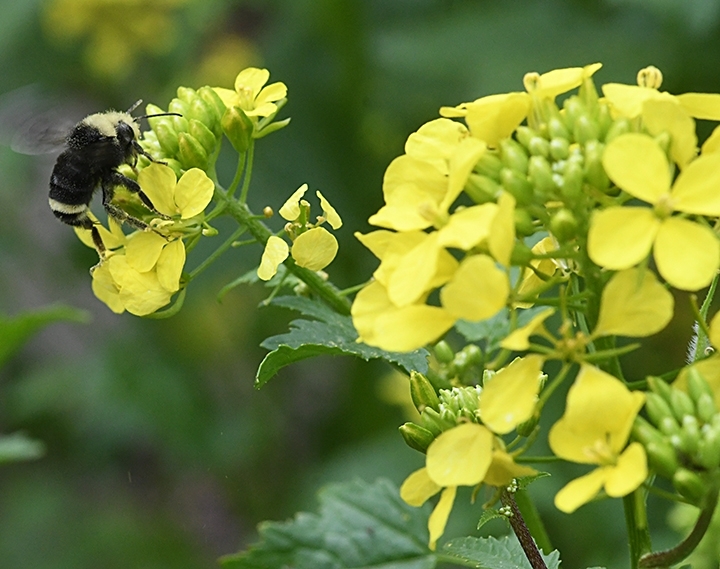 With each plant, they provide a description; origin and natural habitat, range and use in California; flowering season; resource for bees (such as pollen and nectar), most frequent bee visitors, bee ecology and behavior and gardening tips. The book offers tips on how readers can “think like a bee.” It devotes one chapter to “Beyond Bee Gardening: Taking Action on Behalf of Native Bees.” In addition, the book provides quotes on bees and/or bee gardens from Extension apiculturist Eric Mussen (retired) of UC Davis: Ellen Zagory, horticulture director of the UC Davis Arboretum; and Kate Frey of Hopland, a designer of sustainable, insect-friendly gardens throughout California and in some parts of the world. For more data on the book, the authors, and purchase information, access the publisher's website at https://heydaybooks.com/book/california-bees-and-blooms/. 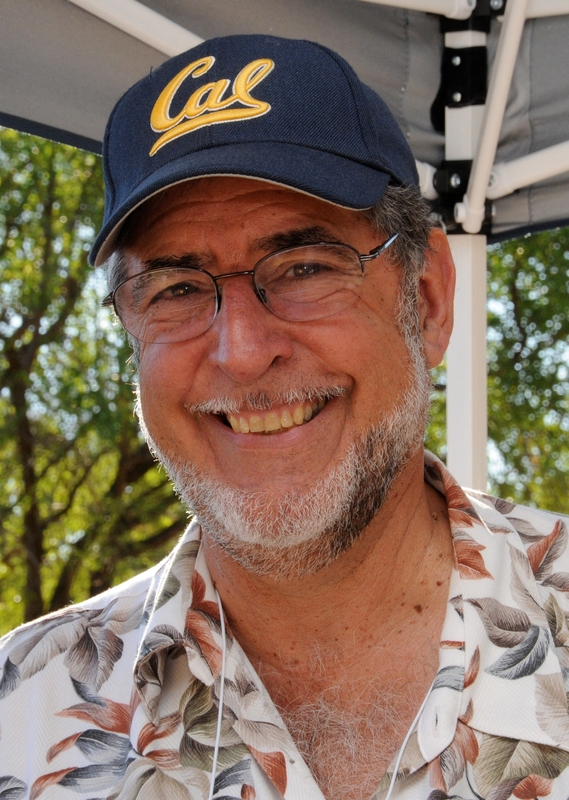 And for ongoing research on California's bees and blooms, be sure to check out the UC Berkeley website, appropriately named www.helpabee.org..
Give me an "A" (for excellence). Give me a "B" (for bee). Give me a "C" (for Cosmos). 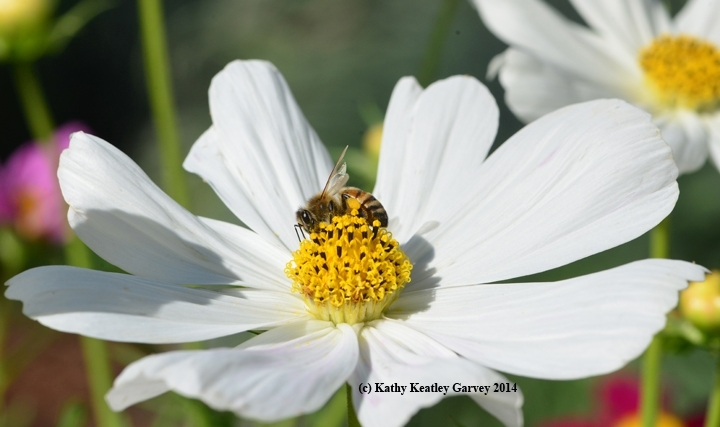 Watching honey bees collect nectar and pollen on the showy Cosmos (Cosmos bipannatus) is not to be missed. As if performing a ballet, the enchanting bees enter stage left and are such show-stoppers that you want to erupt with applause at every precise move. Bravo! Cosmos is a spectacular annual with saucer-shaped floral heads, ranging in color from white and pink to lavender and crimson. It's a relatively late bloomer. 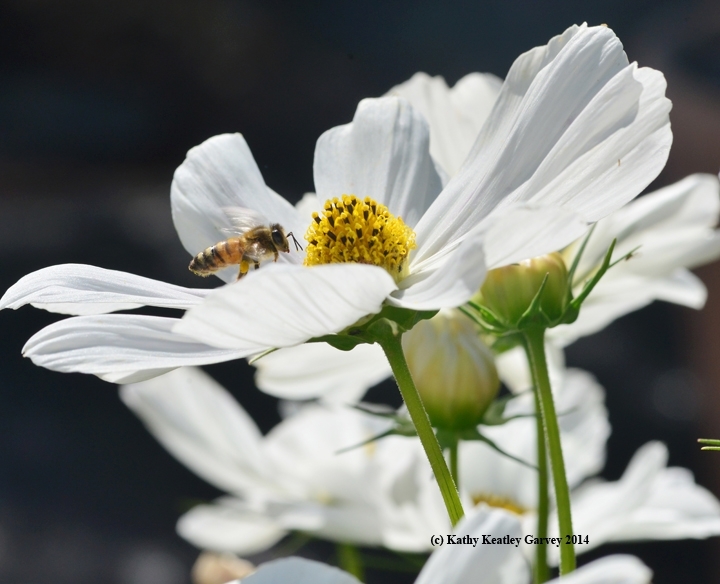 In our family bee garden, they began blooming in late summer and are continuing into fall. In their newly published book, California Bees and Blooms: A Guide for Gardeners and Naturalists, entomologists Gordon Frankie of UC Berkeley and Robbin Thorp of UC Davis teamed with photographer Rollin Coville (UC Berkeley-trained entomologist) and botanist Barbara Ertter (UC Berkeley) to offer interesting information on bee species and advice for growing and managing bee friendly plants. It's a "must-have" for every gardener and naturalist or would-be gardeners and naturalists. Did you know there are more than 1600 different species of bees in California alone, and some 4000 throughout the country? 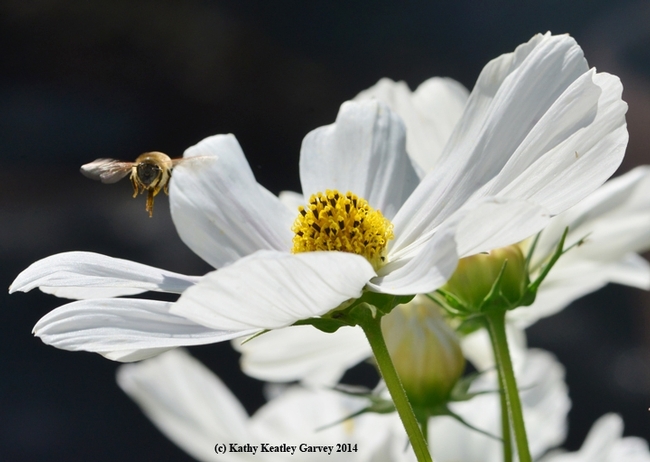 One section goes into depth about plants, including Cosmos. 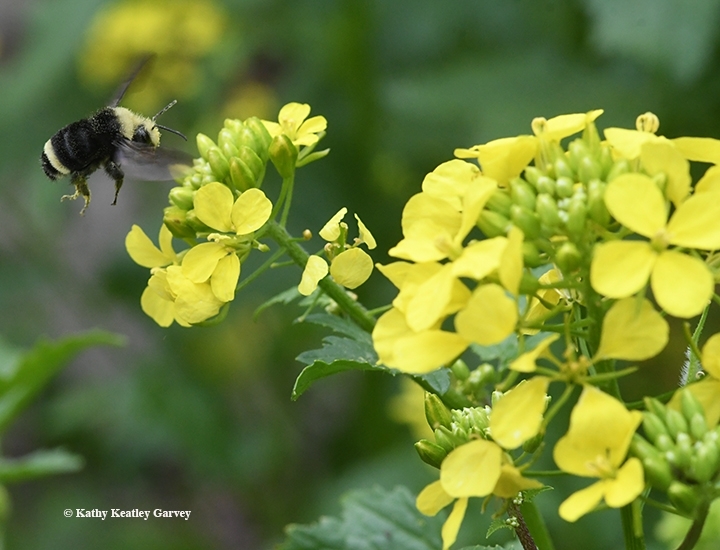 You'll learn its description, origin and natural habitat, range and use in urban California, flowering season, resource for bees (nectar and pollen), most frequent bee visitors, and bee ecology and behavior. 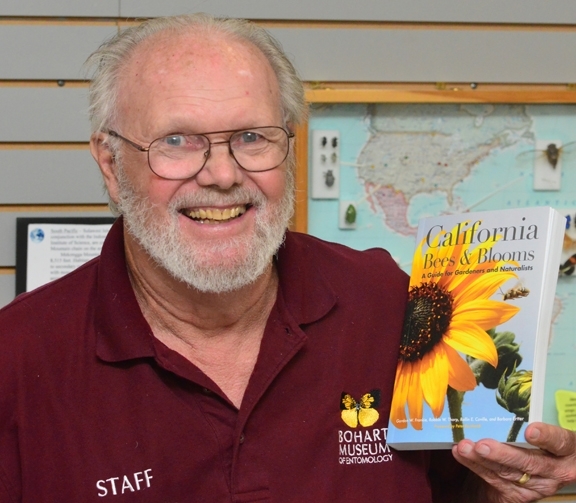 It's not surprising that the book, by Heyday, is published in collaboration with the California Native Plant Society. 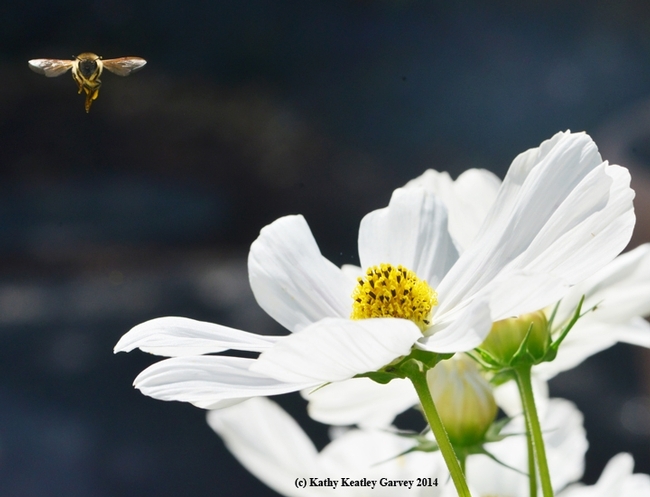 And what are the most frequent bee visitors? "A wide variety of bee species, especially Melissodes robustior, Melissodes species, and Halictus ligatus. In the Central Valley, it attracts honey bees, Agapostemon texanus, Anthophora urbana, Xeromelecta californica, and Svastra obiqua expurgata." The authors describe all those species--and more. 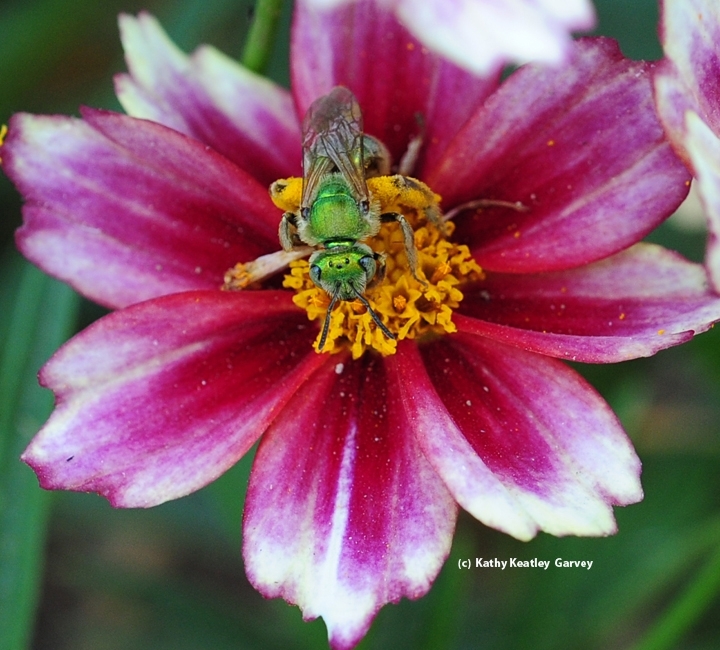 Some we know generally as longhorned bees, sweat bees, metallic green sweat bees, digger bees, and sunflower bees.